Further the classic look of your formal garden by adding the Dura-Trel Bakersfield Arbor to it. 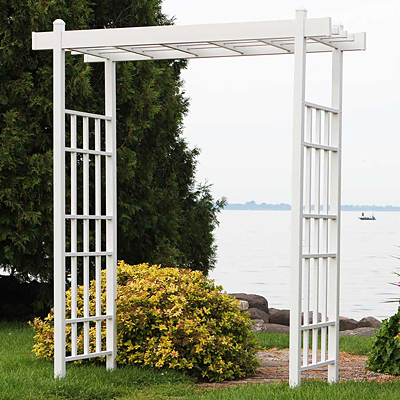 The flat top, square posts, and rectangular grid on this lasting item add a bevy of angles to your garden, capturing attention with ease. This design perfectly complements a formal, organized garden, or brings a bit of structure to a natural landscape. Intersecting slats on each side panel form a rectangular grid, and this pattern continues across the top of the unit for a lovely and cohesive look. The grid handily supports a climbing plant, while the white color of the structure contrasts your blooms. The lasting, all vinyl body contains the highest concentration of titanium dioxide available, acting as an ultraviolet light stabilizer, ensuring the unit will not fade, peel, warp, or crack. This helps the arbor remain crisp white and lovely for many seasons in your garden, and its included anchors make mounting simple. Add an organized look to your backyard or garden with help from this Bakersfield Arbor. Assembly required. Made in the USA. Twenty year guarantee.